Jaguar launches its latest campaign, 'British Intelligence,' in collaboration with Spark 44. After the success of Jaguar's previous spot 'Rendezvous', award winning director Tom Hooper pulled out another showstopper in the form of 'The Lab', as part of Jaguar's new 'British Intelligence' campaign which stars Nicholas Hoult. In the 90" spot, we are taken inside the Jaguar innovation lab by actor Nicholas Hoult, the "brains behind the villainous operation," as he showcases the cutting-edge technology of Jaguar vehicles. The Mill aided in bringing the innovation of Jaguar's lab to life by incorporating a host of CG effects that highlight the engineering and technology under the hood of the newest Jaguar model line up. 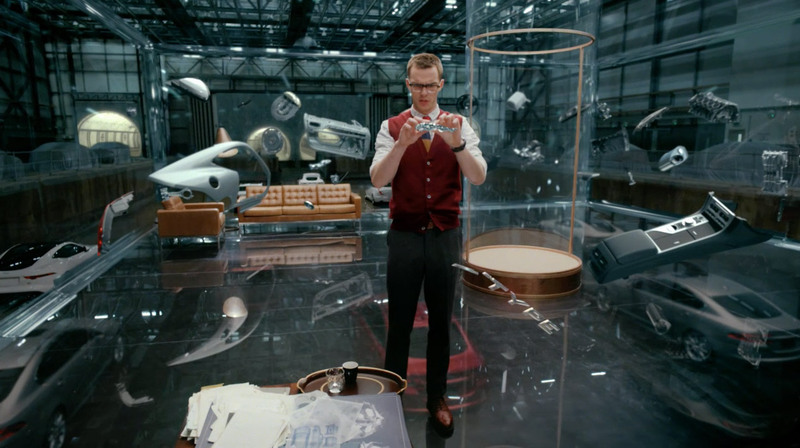 The Mill's VFX team worked to create 10 different types of CG car, which had to fit seamlessly into the live action shots. Each exterior and interior was faithfully reproduced as well as chassis and running gear components using CAD data supplied by Jaguar. The components were then animated to interact with Hoult as if they were 3D projections. The team were also involved in transporting Hoult from a green screen to the multi-layered villain's hideout also seen in 'Rendezvous'. This was achieved by shooting live action data and creating a number of fully 3D environments, then comping in Hoult and creating a series of smooth transitions from hallway to lab. Executive VFX producer Chris Batten comments, "It was great to get the Jaguar team back together working with Tom Hooper and the Spark 44 guys again. With a team of over 30 VFX artists strong, we produced a huge body of work. The TVC campaign showcases the F-type, the XF, the XJ models, with each film requiring specific CG animations, which amounted to over 100 FX shots." The Mill worked on all areas of the campaign, with VFX team's intrinsic CG work featured on the print, poster and digital contentexecutions.